This gripping insider's look at the contemporary American trade union movement shows that reports of organized labor's death are premature. 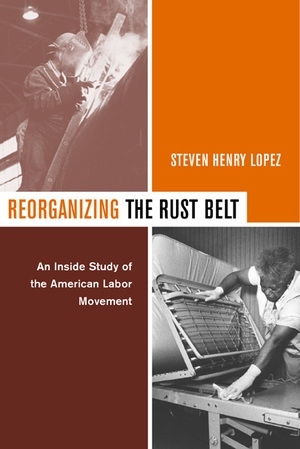 In this eloquent and erudite narrative, Steven Henry Lopez demonstrates how, despite a hostile legal environment and the punitive anti-unionism of U.S. employers, a few unions have organized hundreds of thousands of low-wage service workers in the past few years. The Service Employees International Union (SEIU) has been at the forefront of this effort, in the process pioneering innovative strategies of grassroots mobilization and protest. In a powerful ethnography that captures the voices of those involved in SEIU nursing-home organizing in western Pennsylvania, Lopez illustrates how post-industrial, low-wage workers are providing the backbone for a reinvigorated labor movement across the country. Reorganizing the Rust Belt argues that the key to the success of social movement unionism lies in its ability to confront a series of dilemmas rooted in the history of American labor relations. Lopez shows how the union's ability to devise creative solutions—rather than the adoption of specific tactics—makes the difference between success and failure. Steven Henry Lopez is Assistant Professor of Sociology at Ohio State University.